The Instructor 50 was a small system designed to teach the use and programmation of the Signetics 2650 CPU. But it was also a real micro-computer with a tape interface to save and load programs, and a S-100 compatible expansion bus. The built-in display was only a eight-digit, seven-segment LED display... When turned on it displays "HELLO". The keyboard was made of an hexadecimal keypad (16 keys) and function keypad (12 keys). Interaction is also made through 8 parallel I/O switches and their corresponding LEDs. 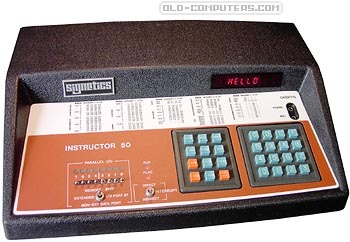 The only software built-in the system was the monitor (called User System Executive or USE), used to program the Instructor 50. Of course, programmation was made in hexadecimal through a simplistic assembler. The 2 KB ROM was used to store the monitor. RAM was 640 bytes, but 128 bytes were used by the monitor, leaving 512 bytes for programmation. But having 14 address lines, the 2650 CPU was capable of addressing 32K bytes ! see more Signetics Instructor 50 Ebay auctions !